vegetable, fruit, seafood, meat and fish products. 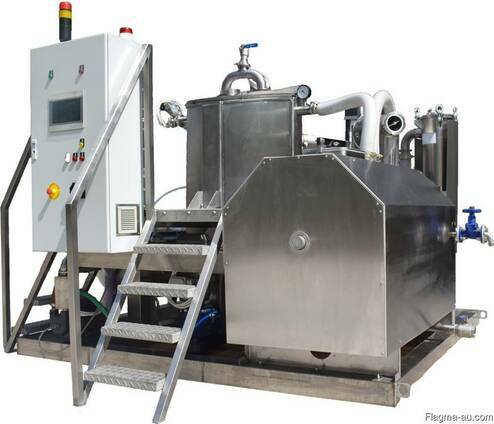 The process of vacuum frying/drying is quite complex in terms of the sequence of operations performed, and therefore Normit VF vacuum frying/drying plants are equipped with a completely automated control system with various recipes, which minimizes the effort needed from the operator and eliminates errors connected with the human factor. All processes that are carried out are shown on the operator’s panel (process visualization). Programming of new recipes is done with the help of an intuitive interface. Frying under vacuum conditions (at low temperature) is a unique and cutting-edge heat treatment method. It allows you to achieve exceptional qualities for your ready product. The Normit VF vacuum frying plant allows frying products until they become crunchy, at temperatures up to 120°C, which prevents acrylamide from forming. The fried product does not contain carcinogenic substances and it presents an alternative for the majority of snacks that are available on the market. Under vacuum conditions water is eliminated from the product in a very short amount of time. Furthermore, under vacuum conditions oil does not penetrate into free pores, and it is fully discarded while preserving the vacuum. This allows you to lower the content of oil in the ready product down to just a few percent, whereas in products that have been fried in the traditional way, at atmospheric pressure, the oil content may reach as high as 30%. Depending on the type of product and the preliminary processing of it (blanching, impregnating, freezing), it is possible to obtain products with various characteristics: with a more or less dense structure (puffy snacks), more crunchy or more flexible, with various degrees of color intensity, etc.